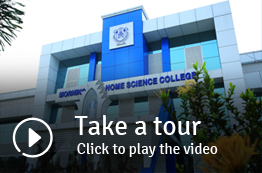 Inauguration of Home Science College by His Eminence Joseph Cardinal Parecattil on 4th July. Started a two year Diploma Course in Home Science with 12 students. Sr. Teresitta CSN assumes charge as the first Principal. Sr. Loyola CSN takes charge as Principal. College is renamed as Morning Star Home Science College. Started B.Sc. Degree Course in Home Science affiliated to Kerala University. Ms. Mary Pothen, former Principal of SIET College, Madras is appointed as Principal. The two Year Diploma Course started in 1963 got reduced to one year. Two batches of a Short Course of three months duration also started. Sr. Loyola reassumes charge as Principal. Starting of National Service Scheme (NSS). The new Hostel building, aided by UGC, is inaugurated. College comes under Direct Payment System. Commencement of Pre Degree Course with two batches in Science and one batch in Arts. The Diploma and Short Courses in Home Science got bifurcated from the college and started anew as Nazareth Home Science Institute. PTA, Alumni Association and Planning Forum are formed. Mahatma Gandhi University comes into existence. The College gets affiliated to Mahatma Gandhi University. Women's Cell and Career Guidance Cell are formed. Science Block with four Laboratories and classrooms inaugurated. Department of Physical Education introduced. Silver Jubilee Year of the College. Silver Jubilee Memorial Auditorium is blessed and inaugurated. Introduction of Save-a-Star, a project aimed at extending financial support to the needy students. Introduced'Grahadarshan'- an intercollegiate training programme - to commemorate the services of Sr. Loyola CSN, former Principal. Sr. Lourdes takes charge as Principal. Inauguration of the Library Block. Sr. Isabell takes charge as Principal. 'Chethana'-a training programme for the mothers of our students- is started to commemorate the services of Sr. Lourdes, former Principal. Nazareth Home Science Institute is shifted to a new building in the same campus. Sanction for B.Sc. Chemistry (Vocational). Sanction for B.Sc. Physics (Vocational). The college gets accredited by NAAC at Three Star Level. Sanction for M.Sc. Home Science. The college secures State Award for the Best NSS Unit. Ms. Elsamma V.V. gets State Award for Best NSS Programme Officer. Introduction of the Yoga Centre. The Department of Economics organized the first International Seminar. Sr. Cicily Jose (Sr. Leatus CSN) takes charge as Principal. Expansion of the College Hostel. Introduced Basic Certificate Course in Yoga. Sr. Alphonsa M.K. takes charge as Principal. Sanction for M.Sc. Zoology (Self financing).